After A Workout, Do this! After a good workout, what should you do? What should you eat you after a workout? One of my favorite summer post morning workout meals are steel cut oats with Jersey fresh blueberries. I cook my steel oats two cups at a time in the crock pot. I prepare the oats according to package instructions, but I like to add my little twist to them. What’s my spin? One medium to large peeled Fuji or Gala apple per cup of oats. 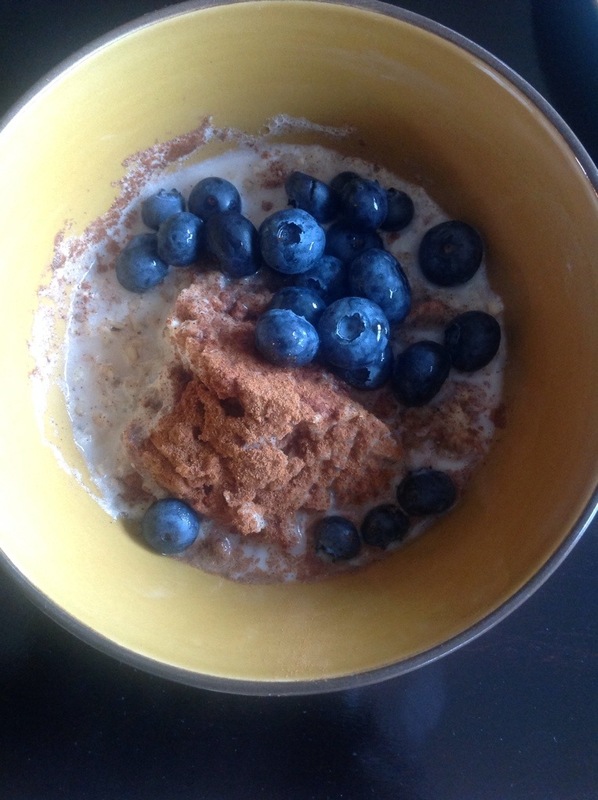 One tablespoon of cinnamon, ground flax-seed, chia seeds, and a teaspoon of nutmeg. I also use part water and part almond milk (original). With the oats already cooked, I don’t have to cook when I arrive home from the gym. I scoop out a half cup of cooked oats, toss in fresh blueberries and a little almond milk (to loosen ’em up) and warm up the cereal in the microwave. Yummy, filling and full of fiber! Fiber keeps the bowels moving, helps with cholesterol, blood sugar levels and maintaining healthy weight. Nuff said!! Lol! I used to add bananas, but my trainer and friend hipped me to the sugar content. While training for my first figure competition, I really had to watch my sugar content, so due to the sugar, I reduced my banana intake. While bananas are high in potassium (422 mg), high in carbs (27g), which are great for runners, they also contain a decent amount of sugar (14g). Depending on your fitness goals, you may need to watch your sugar intake. During the school year, when my schedule is tight, I prep the oats the same way. I pack the oats and take them to work with me and they serve as a morning snack. A full crock pot lasts me about a week. If you are confused about the carb thing, it’s not as complicated at you think. After reading, Tosca Reno’s, The Eat Clean Diet Recharged (which I’ve mentioned before), I got a better understanding of the “Good (complex) Carb” vs. the “Bad (simple) Carb” sensation. The better or good carbs are known as complex carbohydrates. The other carbs… are know as simple carbohydrates. For more information on carbs, check out the list at the end of this post. Today’s lean protein choice is a simple one. 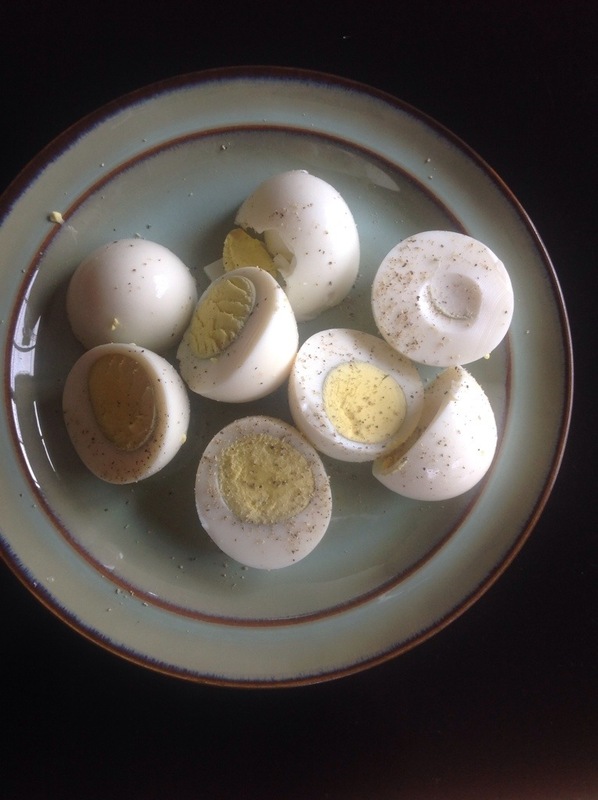 Hard boiled eggs (my lean protein source). I boil about 18 eggs in advance and store them in the fridge. Again, if I don’t feel like cooking an omelet, I grab four eggs (two egg whites). The eggs are an excellent source of protein (6g of protein per egg). According to the Mayo Clinic, 100% of the 186 mg of cholesterol is found in an egg is in the yolk of the egg. You can eliminate the cholesterol by only eating the egg white. Okay, so if you’re a vegan or don’t eat a lot of meat, I didn’t forget about you. No problem! There are plenty of healthy protein alternatives, check out Health.com Top 13 Vegan and Vegetarian and Protein Sources. Seriously, I see a vegan life in my future. Why Eat After A Workout? Easily put, your body needs fuel… BEFORE and AFTER your workout. I’ve read some complex articles on the topic, but I’ll try to keep this simple. Like a car, your body needs fuel to perform optimally.The body needs a good source of fuel before you workout so you have the energy throughout your workout. No two bodies are the same. How much and what you eat BEFORE your workout depends on the activity, the intensity, the duration, and your fitness goals. Of course you don’t want to overeat, but also for the sake of “losing weight,” you should avoid working out on an empty stomach because it is ineffective and wastes the time spent in the gym. Remember the goal is to maintain a healthy lifestyle not to adapt an extreme diet that is unhealthy, unrealistic and something that you cannot keep up with for any great length of time. Beware of all the fad diets; they don’t work. So after your workout, you’re feeling all good and pumped up. But now you have to complete the last step and refuel the body. AFTER your workout, the faster the protein and carbohydrates get into your body the better. In one way or another, you’ve broken down and burned out your muscles. The final step is to eat well (within the hour if possible) to nourish the body and allow your muscles to rebuild and repair. If you don’t eat, the “rebuilding” process will not occur and you will have wasted valuable time and energy. As soon as I walk off the gym floor, I head to the locker room. I wash my hands, drink a protein shake and eat a couple of plain unsalted rice cakes. I learned this from my friend and trainer during my figure competition training. I usually drive straight home. When I get home, the real post-workout meal gets wolfed down. On this particular day, my post workout meal was the steel oats and hardboiled eggs. Okay so I said way more than I planned in this post. However, I felt necessary to elaborate because if you’re trying to change your lifestyle and get fit, you must learn to eat better. You can work out 24/7, but if you skip meals, eat crap (processed foods) before or after your workout, eat garbage on your rest days, you won’t see results. I am asked about what and how I eat, so I’m taking the time to share what I’ve learned with you. Think consistency. There are no easy fixes. Think lifestyle! This entry was posted in Fitness, Healthy Eating, Healthy Living, Inspiration, Uncategorized and tagged blood sugar levels, blue berries, carbohydrates, carbs, cholesterol, complex carbohydrates, crock pot, CrossFit chick, diet, fit mom, Fitness, hard boiled eggs, healthy-living, lean protein, lean protein source, Nutrition, post-workout meal, protein, simple carbohydrates, steel-cut oats, vegan, workout. Bookmark the permalink. Very informative! I never eat before my workouts, but I definitely will start. Even if it’s only some fruit or veggies! Have you tried over night oats. Not bad. Just had to get used to cold oats. No I haven’t. Tell me more… I’ve eaten my steel oats cold (when I wasn’t near a microwave). I just read this article (http://www.buzzfeed.com/samimain/overnight-oats-recipes-to-restore-your-faith-in-breakfast) on “night oats,” I think I could do that..